Privacy Statement. We are committed to protecting your privacy. Authorized employees within the company on a need to know basis only use any information collected from individual customers. We constantly review our systems and data to ensure the best possible service to our customers. No Medical Information. 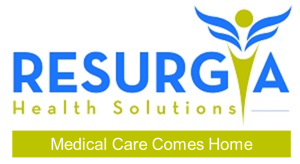 Information on the website is provided to further general understanding of Resurgia’s services, and provide an avenue to initiate contact. All information provided on this website is for general information purposes only. The information provided by the website is not intended nor implied to be a substitute for professional medical advice from health care providers. Incomplete/Inaccurate Information. The information available on this website should not be considered complete or exhaustive and may not reflect the most current information on transitional care and/or medical care at home. While Resurgia attempts to make sure the information included in this website is accurate, there may be delays, omissions, or inaccuracies in the content provided on this website. As a result, Resurgia does not represent that the information contained herein is complete, accurate and up to date in every case. No Warranty. The information contained in this website and in any other website accessed via links from this website is provided as is or as available without representation or warranty of any kind, express or implied. ALL SUCH REPRESENTATIONS AND WARRANTIES ARE HEREBY DISCLAIMED, INCLUDING, WITHOUT LIMITATION, THE IMPLIED WARRANTIES OF MERCHANTABILITY AND FITNESS FOR A PARTICULAR PURPOSE. Resurgia does not warrant or represent the timeliness, content, sequence, accuracy, or completeness of any information or data furnished hereunder. Liability Limitation. In no event shall Resurgia be liable for any direct, indirect, incidental, special, exemplary, punitive, or any other monetary or other damages, fees, fines, penalties or liabilities arising out of or relating in any way to use of this website or websites accessed through links and/or information contained in this website. In no event shall Resurgia be liable for any lost profits, lost data or business arising out of or relating in any way to use of this website or websites accessed through such links and/or information. No Guarantee Against Errors, Delays, Losses. Resurgia cannot guarantee and does not warrant against human and/or machine errors, omissions, delays, interruptions or losses of information or data, infringing material, or defamation. Resurgia cannot and does not guarantee or warrant that files available for downloading on this website will be free of infection or viruses, worms, Trojan horses or other codes that manifest contaminating or destructive properties. No Guarantee About Linked Websites. Resurgia does not endorse and is not responsible or liable for the materials contained in or through, or products available through the materials contained in other websites accessed via links from this website. Linking to such websites is done at the user’s own risk. Resurgia cannot guarantee and does not warrant the availability of such linked websites. Resurgia cannot guarantee and does not assume responsibility for any damage incurred from accessing such linked websites nor from use, browsing or downloading information from such linked websites. How We Use Your Information. The information we learn from customers helps us personalize and continually improve your experience at our website. Here are the types of information we gather. Information You Give Us: We receive and store any information you enter on our website or give us in any other way. We do not sell or rent your personal information to others without your consent. We use the information we collect only for the purposes of sending promotional information, enhancing the operation of our site, serving advertisements, for statistical purposes and to administer our systems. We DO NOT use third parties to serve the advertisements you see on our site, to help administer promotional emails, or to administer drawings or contests, but reserve the right to do so in the future without advance notice. Our computer system protects personal information using firewall technology. Information from Other Sources: For reasons such as improving personalization of our service, we might receive information about you from other sources and add it to our account information. When processing your credit card payment, we will ask for the card type, account number, expiration date, and your card’s billing address. We will not sell, share, or rent your personal information to any third party or use your e-mail address for unsolicited mail. Any emails sent by Resurgia will only be in connection with the provision of agreed services and products. These terms and conditions form part of the Agreement between the Client and ourselves. By accessing this website and/or undertaking of a booking or Agreement indicates your understanding, agreement to and acceptance, of the Disclaimer Notice and the full Terms and Conditions contained herein. Your statutory Consumer and Patient Rights are unaffected.